In Lesson 1, you learned about the Standard Ad options. In Lesson 2, we created a variation of that when we promoted a post. Now it’s time to dig into Sponsored Stories! What are the types of Sponsored Stories? How do you create a Sponsored Story? A Sponsored Story is one of the easiest ad units to create, yet it’s often reported to be one of the most successful. This needs to be part of your strategy! Taken literally, a Sponsored Story is the promotion of a friend’s social interaction with a Page, Place, App, Domain or Event. Story = What is shown to friends when a user likes, comments, shares on a post; likes a Page; checks in to a Place; uses an App; shares a link from a Domain; or RSVPs to an event. Stories are generated naturally, but a user will only see it if they are online at the time it is generated. 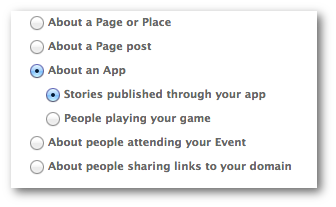 By promoting specific story types (like users liking your Page), you can leverage that social proof and make sure that as many friends of Fans see the story as possible. Also note the important distinction here: Sponsored Stories can only be shown to friends of Fans. Otherwise, there is no context to a person you don’t know interacting with something. You can create one of these ads by selecting Sponsored Story within the Type drop-down in the Creative & Placement section of ad creation. The most common of these three is “Likes your Page.” This is commonly referred to a Page Like Sponsored Story, and you undoubtedly see several of these every day. I keep at least one running all the time since they are so easy to create and so effective. This is a really good way to get more people to attend your event. By sponsoring it, an ad can be generated that will be shown to the friends of those attending. Also known as a Domain Sponsored Story, this is one of my secret weapons that I use to drive more traffic to my website. 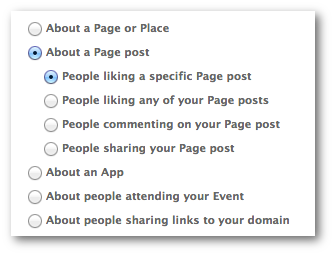 It is not at all associated with your Facebook Page and promotes any interaction of users with your domain (sharing links from your website). I’ve found these to be extremely effective. More on this in a future section and lesson! An important caveat here. Facebook has said that they will be simplifying their ad options, and there have been rumors that this includes eliminating Sponsored Stories. However, it’s not clear if and when this is going to happen, whether it will impact all Sponsored Stories or if it will impact Power Editor. In other words, use these while you can! Need personal one-on-one help from Jon? Set up a training session!